The bullish and bearish signals are not necessarily contradictory, as they operate in different time frames. I believe that they reinforce my conviction that the market is undergoing a long-term top. Tops are processes. Stock prices don`t go straight down when the market tops out. The most recent break was just a warning. 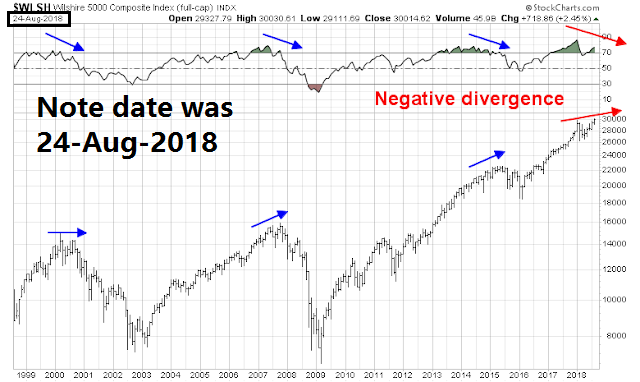 Even if you are bearish, I reiterate my view that the markets are too oversold to meltdown from current levels. Rob Hanna of Quantifiable Edges found that market bounces that begin on a Friday tend to be the most reliably bullish. Here is the other feedback that I received which makes me believe that the US equity market is in the process of making a top. The most notable comments came from multiple readers, who alerted me that a number of well-known technicians had turned cautious. 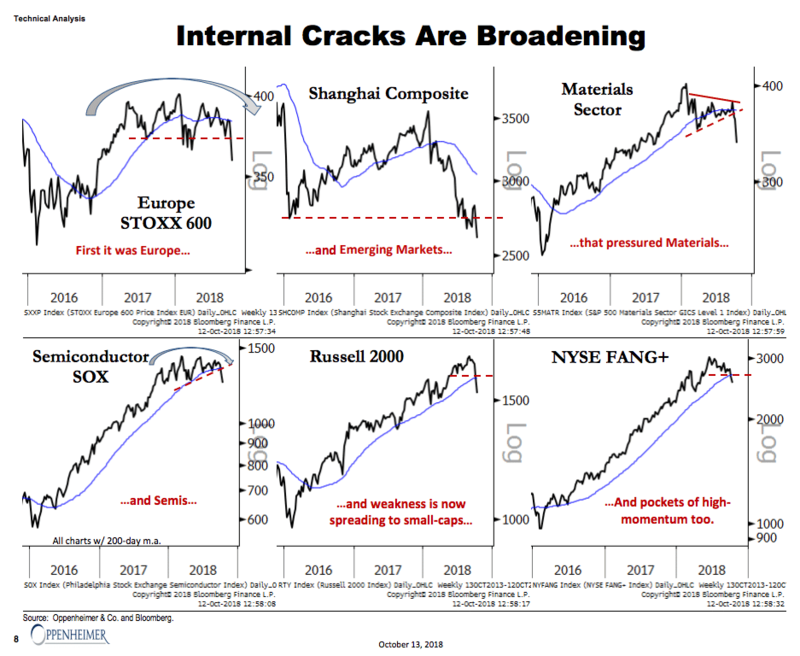 Josh Brown highlighted the analysis from Ari Wald, who observed that internal cracks, which appeared first in non-US markets, are broadening. These changes of hearts illustrate the adage that market tops are processes. 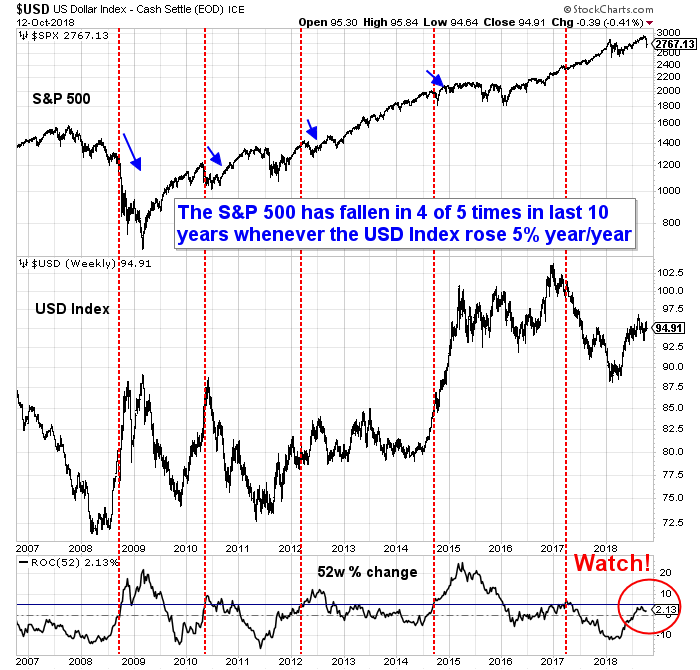 Different indications turn bearish in different time frames. I turned cautious back in August due to a negative monthly RSI divergence (see 10 or more technical reasons to be cautious on stocks). Since then, the market rose to an all-time high and then fell. Here we are today, as other technical analysts have followed suit and turned cautious, sparked by trend line violations and trend following models, which tend to be late by design. One of the bearish tripwires that I had outlined in yesterday’s post (see A correction, or the start of a bear market?) was the US Dollar. I wrote that the stock market had a history of running into trouble whenever the year/year change in the USD Index rose above 5%. One reader astutely pointed out there are really two US Dollars that are relevant for the financial markets. There is the onshore USD, which affect terms of trade, and the operating margins of large cap companies with foreign exposure. In addition, there is the unregulated offshore USD market, otherwise known as eurodollars, whose year/year change had already breached the 5% level. 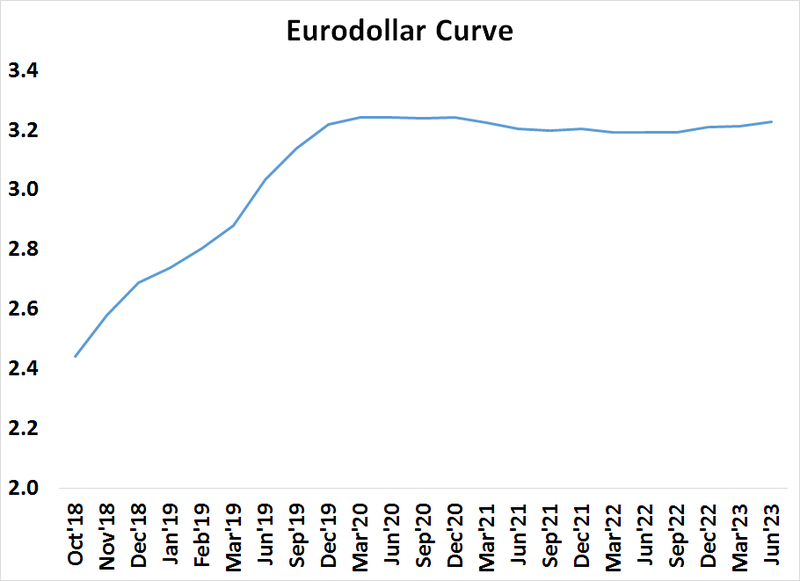 Indeed, the eurodollar futures curve start to flatten and slightly invert starting in June 2020. In order to analyze the effects of offshore USD stress, I used the inverse of the EM currency ETF (CEW) as a proxy for the offshore USD, as EM markets are far more vulnerable to hiccups in offshore USD shortages. As the chart below shows, a breach of the 5% year/year level has seen mixed results in the last 10 years. The stock market took a tumble only half the time. In conclusion, this analysis shows that EM markets are especially fragile to further shocks, but fragility does not necessarily translate into bear markets. 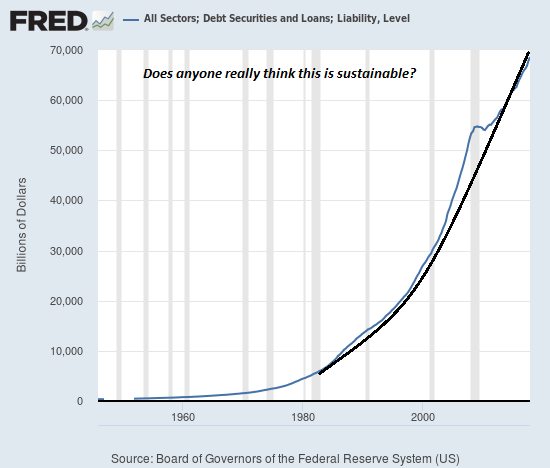 However, it does illustrate an additional risk that investors should monitor. Car sales in China fell 11.6% in September to 2.4 million – the third month in a row of year-on-year decline. 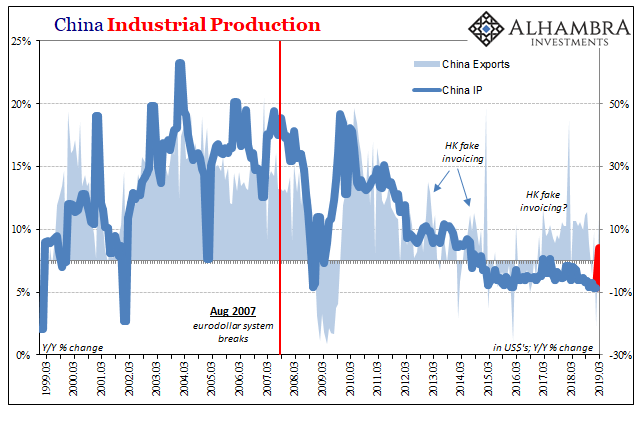 The deceleration comes amid a slowdown in China’s economy and has pinched performance at vehicle manufacturers around the world. At Ford, September sales in the country tumbled 43% compared with 2017, the US carmaker said on Friday. The report followed steep declines reported earlier by Volkswagen, Jaguar Land Rover and General Motors. Indeed, my China pairs trades of New (consumer) China vs. Old (finance and infrastructure) China ETFs show that New China is lagging on a relative basis. That said, I agree with Chris Balding when he stated that the greatest threat to Chinese stability is its property market, which is suffering from an off-the-charts level of financial leverage. I am also cognizant of Anne Stevenson-Yang’s comment that cracks in the car market may be a warning of further property market weakness. I will therefore remain with my property developer stock prices as the key canary warning of trouble in the Chinese coalmine. Lastly, some alert readers pointed out a Mark Hulbert column indicating that the “smart money” corporate insiders are buying this dip. The charts from OpenInsider confirms this assessment. Insider selling (red line) has dried up recently and fallen below the level of insider buying (blue line), which is a buy signal for this indicator. Does that mean that stock prices will recover and rally to fresh highs? For a longer term perspective, I analyzed the history of insider buy signals from 2007 to 2011. 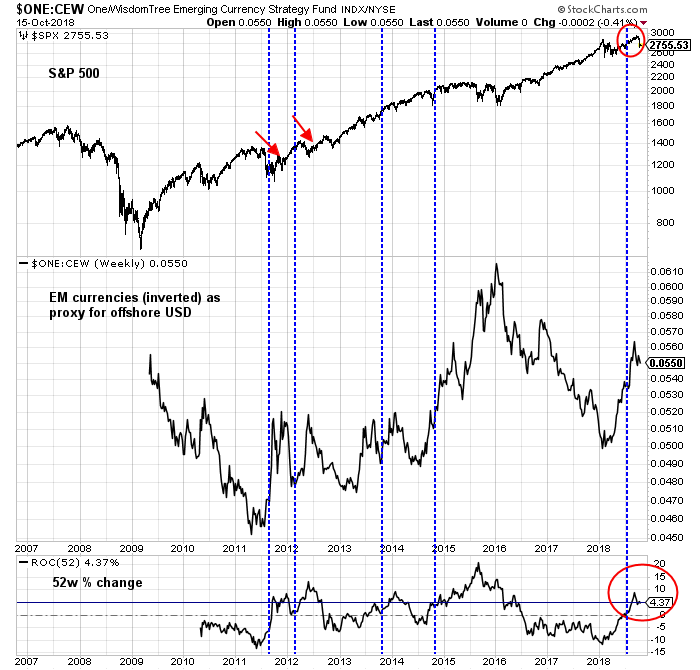 Excessively insider buying compared to sales have historically been good tactical buy signals and they have indicated either low immediate downside market risk or market rallies in the weeks and months after the signal. 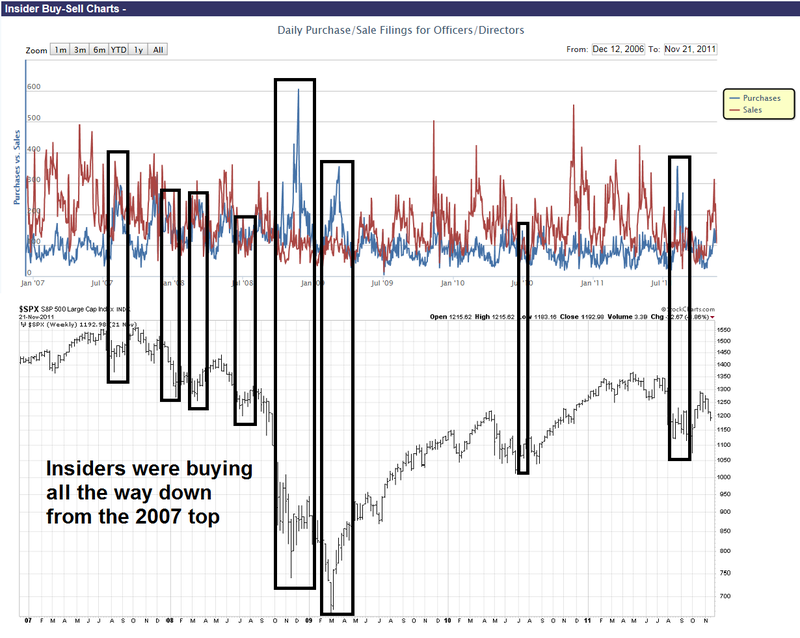 However, insiders were not perfect market timers, as they were buying all the way down after the 2007 market peak. Bottom line: Investors shouldn’t count on insider trading as a buy signal. However, traders can use insider buying as a tactical trading signal. For the last word, I highlight Callum Thomas’ (somewhat) long running (unscientific) equity sentiment poll done on the weekend. As the SPX cratered by -4.1% last week, you would have thought that sentiment would have deteriorated and the bears would come out in force. Instead, sentiment improved, indicating that traders were itching to pile in and buy the dip. I interpret these conditions as the market poised for a relief rally, but the intermediate term path of least resistance for stock prices is still down. Sentiment hasn’t fully washed-out yet. In short, market tops are processes. Both investors and traders need patience to navigate this environment. Previous A correction, or the start of a bear market? Next Is there any more pop after the drop?